Chooks-to-Go Pilipinas to face BC Astana in opening game (Live Stream, TV Info and Time) - Balita Boss! Chooks-to-Go Pilipinas begins its 2017 FIBA Asia Championship Cup campaign against BC Astana on Friday, September 22 in Chenzhou-Hunan, China. The team from the Philippines will be headed by national team head coach Chot Reyes. They tapped Gilas naturalized player prospect Isaiah Austin as reinforcement. SEA Games teammates Carl Bryan Cruz from Alaska Aces, Kiefer Ravena, Raymar Jose and Almond Vosotros were also named to the final 12. TNT KaTropa's Norbert Torres and LA Revilla of Kia Picanto are in the lineup along with former La Salle player Jeron Teng, ex-UP Maroon Jett Manuel, former FEU Tamaraw Alfrancis Tamsi and PBA free agent Jeric Teng. CEU reinforcement Rod Ebondo, like Austin, will play as import while Gab Banal and Andre Paras are joining the team as reserves. For BC Astana, a professional basketball club from Kazakhstan, Denis Degtyarev, Maxim Marchuk, Rustam Murzagaliev, Anton Ponomarev, Rustam Yargaliev and Alexandr Zhigulin, six players from the national team that saw action in the recent FIBA Asia Cup 2017, will be leading the squad in the tournament, according to FIBA. The game between Chooks-to-Go Pilipinas and BC Astana is scheduled to start at approximately 9:45 pm (Manila time), and it can be live-streamed at Sports5.ph. Full schedule of the games, results and standings are available at PhilSports.ph. Chooks-to-Go Pilipinas, a team that's built to replace Japan in the tournament, and BC Astana, champions of the 2016-2017 Kazakhstan Basketball Championship (KBC), were drawn into Group A together with Thailand's Mono Vampire, Iran's Petrochimi, Palestine's Sareyyet Ramallah. 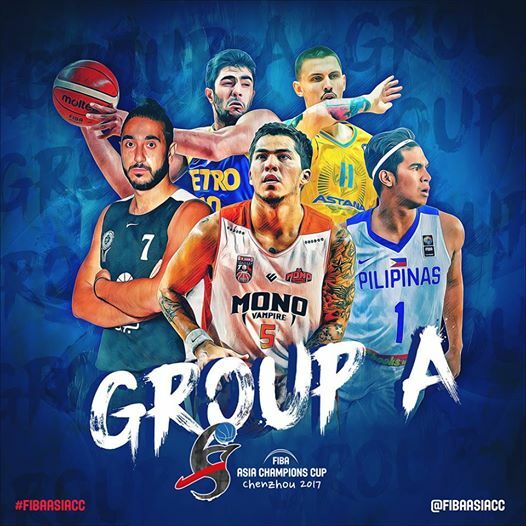 The basketball clubs that completed the tournament and bracketed in Group B are defending champion China Kashgar, who will have Gilas naturalized player Andray Blatche, Al Riyadi of Lebanon, Dacin Tigers of Chinese-Taipei, ONGC of India, and Al Shabab Al Ahli of the United Arab Emirates. The Group Phase will run until September 26. The Final Round will start on September 28 and end on September 30.